For the first time in months, I have no library books in my possession. This isn’t because I’ve fallen out of love with the library or anything like that. No, no. It’s because I’ve been so caught up in the library and all of the reading treasures housed within that I’ve been neglecting all of the beautiful books awaiting my attention in my own library! As some of you may know, I’m currently under a self-imposed (and flexible) book ban. It’s not a permanent thing. I haven’t lost my mind and decided not to buy books ever again. I haven’t decided to categorize books as clutter. Nothing like that; I have a wedding to pay for and books ain’t cheap. So I started going to the library to save money. And instead of exercising anything remotely resembling bookish self restraint, I started taking home 7 or 8 books every few weeks. But they have to be back at the library in a few weeks. So even though I could renew them (and occasionally I have), more often than not I just neglect all other books and read the library books. Result: my own books are screaming for my attention. I’m taking a hiatus from the library until I make a dent in some of my own book piles. So what is awaiting my attention? Read on! For Christmas I got four beautiful books and I’ve only read one of them so far (Burial Rites). Night Film by Marisha Pessl, The Massey Murder: A Maid, Her Master and the Trial That Shocked A Country by Charlotte Gray and The Goldfinch by Donna Tartt are all still waiting to be read (and hopefully loved). And yes, I realize that all the books I asked for for Christmas had to do with death. I’m probably less disturbed by that than I should be. I buy classics because I love them and usually they are on some kind of sale. Mostly love but if I can get more books for the same amount of money, so much the better. But reading classics can be a commitment and I get distracted by shiny new reads a lot. War and Peace is still sitting on my shelf, waiting for round two. I’ve made an attempt at Nicholas Nickleby once as well (but as travel reading when it was so not appropriate travel reading) so that needs another go. And The House of Mirth by Edith Wharton. I loved The Age of Innocence and I know I will likely enjoy this one too but again – new and shiny. Last year I read quite a lot of non-fiction. And yet? I didn’t get to all the non- fiction books that I bought. After I saw Lincoln last year, I meant to read Doris Kearns Goodwin’s Team of Rivals but I have yet to do so. I also have a book about Amsterdam that I impulsively bought because I always buy books about Amsterdam or the Netherlands when I see them as they are so rare. 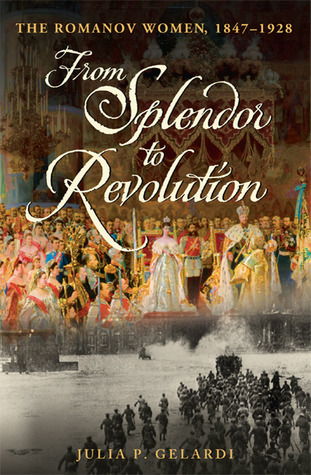 I’m in the middle of The Monuments Men by Robert M. Edsel so that’s progress (so far it’s also insanely interesting and horrifying) but I have yet to crack From Splendor to Revolution, Julia P. Gelardi’s account of the Romanov women from 1847-1928. By all accounts, I will love this book. One of my very favourite biographies was Gelardi’s Born to Rule: Five Reigning Consorts, Granddaughters of Queen Victoria. So for now, although the library calls out to me with the promise of all kinds of undiscovered riches, I’m going to try and resist so that I can make my way through my own books. But like I say, I’m pretty flexible with these things. I’ve finally cracked Catherine the Great: Portait of a Woman and, 150 pages in, it is living up to every single expectation. It is terrific and well written and wonderful and educational and there are pictures! Who doesn’t love shiny pictures? Anyway starting this book got me reflecting on all the other bios of awesome women that I have read. I have a weakness for bios about fantastic ahead-of-their-time women, as any quick perusal of my bookshelves will tell you. I have an especial weakness for royal women. And we’re not even talking about my girl crush on the new Duchess of Cambridge here (although if you have a few hours and you live near me, maybe you want to watch the Royal Wedding again? I have it on DVD. Apparently I feel like watching it 8 times over the wedding weekend wasn’t enough). I’ve put together a modest collection of my very favourite bios of awesome women in the hopes that at least one will strike a note with you. Because women are awesome and sometimes it behooves us to remember that. The Reluctant Empress by Brigitte Hamann was a souvenir book I picked up over my weekend in Vienna. I kept seeing pictures of this woman in an incredible gown with diamond stars in her hair and I needed to know more. So when I saw that same picture on the cover of this book – I had to have it. The Reluctant Empress is Empress Elisabeth of Austria who was incredibly beautiful and mysterious and really did not like being the Empress. She wanted to be free and struggled against the rigid formalities of the Austrian court. It was a wonderful, slightly heartbreaking, thoroughly modern read and I loved it. Another woman struggling against the expectations and conformities of life in the spotlight was Georgiana: Duchess of Devonshire. Amanda Foreman’s sympathetic and meticulously researched book about this ancestor of Princess Diana will leave you wanting more. I’m not ashamed to say that I picked this book up after seeing previews for the movie The Duchess with Keira Knightley. The movie is good, the book is better. Even Keira Knightley fails to do justice to this woman who was ahead of her time politically, romantically, even fashionably, and ended up paying a very high price for it all. If you want to talk about high prices women have paid in history, Marie-Antoinette probably comes to mind, seeing as she lost her life for living a frivolous life at court while the French people starved in the streets. Still, Antonia Fraser’s biography paints a more sympathetic and realistic portrait of the woman who has been wrongly accused of uttering “Let them eat cake.” She was married young to a boy who ignored her for the first years of their marriage and was reviled by the people for the rest of her time. Fraser’s account takes you back through the golden days of Versailles, right through to the ignominious end of the French monarchy. What’s better than the biography of one royal woman? Julia P. Gelardi’s book that covers five of them. Born to Rule: Five Reigning Consorts, Granddaughters of Queen Victoria ably covers the incredible lives of the 5 granddaughters of Queen Victoria who each became Queens in their own right. Alexandra who married the Russian Tsar and met her tragic end in squalor, her body riddled with bullets; Marie, the beautiful flamboyant Queen of Romania who was the mother of 2 more Balkan Queens; Victoria Eugenie who was almost bombed on the parade route on her wedding day, having married the heir to the Spanish throne, passing on the haemophilia gene that so tormented her grandmother and cousin, Alexandra; Maud, who in becoming independent Norway’s Queen, spent the rest of her days pining for England; and Sophie, Kaiser Wilhelm II’s sister, daughter of an emperor and the mother of three kings and a queen who ended her life in exile. I mean come on, you can’t make up more incredible lives than that! My last choice is not a royal woman, but one who had a huge influence on my own young life: L.M. Montgomery. I suspect that she had a pretty important impact on Mary Henley Rubio’s life as well which is probably at least part of the reason for the exquisite Lucy Maud Montgomery: The Gift of Wings. Here’s what I knew about L.M. Montgomery before: she was the brilliant author of the Anne of Green Gables series which I will love for always. After finishing this book, I know that she loved the island she made famous, but hated that her work destroyed the world she loved; that she struggled with mental illness in a marriage based on convenience rather than love or respect; and that having so brilliantly captured childhood in the form of her most enduring heroine, she had nothing but trouble trying to connect with her own young sons. I could go on but I won’t. This time. If you have another book about a famous woman you think I would love, leave it in the comments!